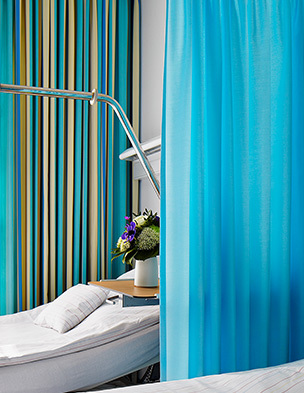 Grosvenor Contracts supply hospital cubicle curtains nationwide. All of our fabric cubicle curtains are made in-house and bespoke to our clients’ requirements. We offer an exciting variety of healthcare fabrics which adhere to all NHS standards and regulations. Because we offer free surveys and our curtains are made to fit we can perfectly cover any track, window or recess you may have. All products supplied by Grosvenor Contacts are designed to be fit for purpose. All our fabric curtains are manufactured with a four point quality check and rigorously tested. We are ISO 9001 and ISO 14001 accredited and our systems come with a five year manufacturer’s warranty. All products supplied by Grosvenor Contacts are designed to be fit for purpose. All maintenance and fitting is undertaken by Grosvenor Contracts’ Service Delivery Technicians who are highly qualified, government security cleared, enhanced CRB checked and PASMA trained. Our Blinds & Curtains are available through NHS Supplychain Textiles and Blinds Framework Agreement, FAG 15285.